Dental Sealants Can Help Prevent Tooth Decay! A sealant for your teeth is one of the best ways to prevent tooth decay. Brushing and flossing go a long way, but they can’t reach every surface, nook or cranny. A sealant can be another line of defense in protecting teeth. A dental sealant is a thin, plastic coating that is painted onto the teeth. Most often sealants are placed on the very back teeth, the big molars used for chewing. These teeth have grooves and depressions where plaque can accumulate. A toothbrush may not be able to clean out all the food debris from these deep grooves. This increases the chance of plaque building up and the potential start of tooth decay. The protective bond of a sealant creates a shield that keeps food and bacteria from the surface of the tooth. Sealants can last for many years. Your pediatric dentist should check the state of any sealants on your teeth at every check up to ensure they are holding up well. Adults and children both can benefit from dental sealants. Children and young teens are especially good candidates for this process as the likelihood of developing pit and fissure decay in the molars can start quite early. In fact, even primary teeth can benefit from sealants. The health of primary, or baby teeth, can have a large impact on the health and proper spacing of permanent teeth. Thus “baby teeth” should be cared for just as much as you would permanent teeth. The first molars, or premolars, begin to erupt around age 6, with the second molars coming around age 12. Protecting these molars as early as possible can prevent future cavities and other dental troubles. In 2016, the Centers for Disease Control (CDC) release a study that reported that school-age children without sealants are three times more likely to develop cavities than children who protect their teeth with sealants. Sealants reduce the risk of decay in molars by almost 80%! Since 9 out of 10 cavities occur in the molars, using dental sealants provides a significant advantage to keeping molars healthy. Sealants are easy to apply and completely painless. The sealant is literally painted onto the teeth, where a special light helps it dry and bond to the tooth. The process only takes a few minutes! 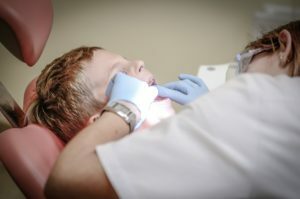 What If My Child Already Has Cavities? If cavities are already present on the molar teeth, a sealant can still be applied to prevent further damage to the tooth. Every patient is different and the dentist will talk with you about the best course of action for your child. Cavities can still occur in between teeth and where the sealant has not been applied. That is why continued brushing and flossing is vitally important to a healthy mouth. If you have questions about sealants or if you think your child could benefit from them, we encourage you to speak with your pediatric dentist. Smile Surfers in Richland and Sumner can provide expertise and experience to answer all your questions.